Outreach and dissemination, for example Citizen Science experiments in which the general public can help scientists collect and analyse data. Besides the work carried out by partners directly involved in ASTERICS, the collaboration aims to establish connections with external partners, in other research fields or in industry. The goal of these connections is to use developments made for the ESFRI facilities for other applications outside of astronomy and astro(particle) physics, or to use developments made outside of these research fields to advance developments for the ESFRI facilities. 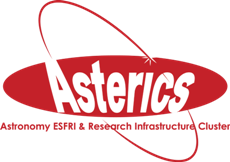 The ASTERICS project is built up in the five work packages: AMST, DECS, OBELICS, DADI and CLEOPATRA.